Sometimes the gift of gardening is passed on genetically. And sometimes it takes a different route. My mother was a gardener all her life. She got it from her father. She drew strength from the soil, strength that she gave back to her plants. A good day for her was a day spent out in the garden. She led a busy life. Looking after a home and seven children took up most of her time. Still, there were vegetables and flower beds. Leaves to rake and weeds to pull. Houseplants in the winter. I didn’t really inherit her love of gardening, but I do have a green thumb. I can throw a plant in the ground and it will flourish. I’ve learned to identify weeds and pull them out. But love it? I’d still rather curl up with a gardening book than do the actual work. But as Mum grew older and started to suffer the effects of MS, it came down to me to help her. During the last summer she was in her house, we focused on the garden. I planted new beds that she could see from her front porch. Hostas under the spirea bush. A friend brought a gerbera in a pot. When the blooms died off, I divided it and planted the pieces so they’d be on view. I was really pleased when they bloomed again. “You’re doing too much,” Mum would fret, watching me from the porch or sitting on her walker beside me as I dug and planted, watered and weeded. But then she’d point out a weed I’d missed, or tell me to dig a cutting in a little deeper and I knew she was enjoying herself, despite her worries. “You’ll never see it mature,” she’d tell me. 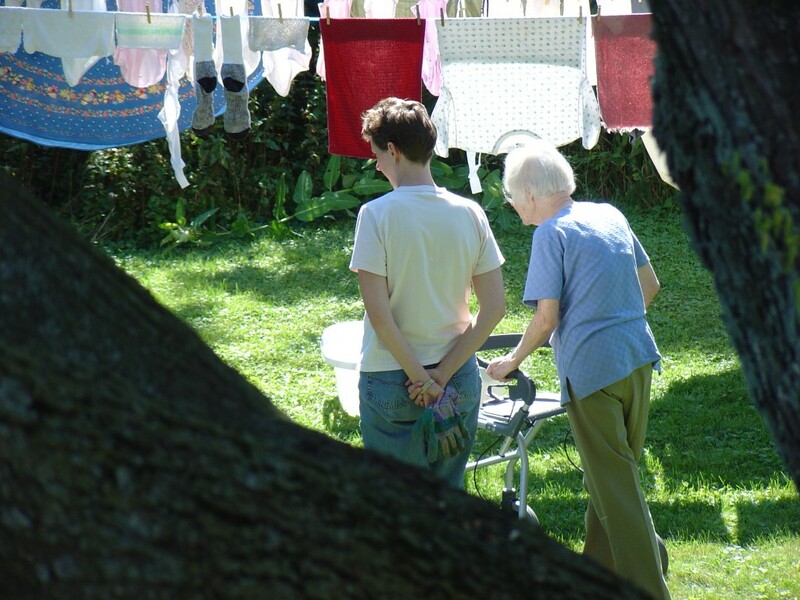 “I don’t know why you’re bothering.” Gardens to Mum were a piece of eternity. This one, I knew, would be ephemeral. A garden for today and don’t think about what tomorrow will bring. If things weren’t going well for her inside the house, I would tell her to get her shoes on and we’d head outside. Pick a weed here, do some watering there. Just getting her hands dirty seemed to make her feel better. And, bit by bit, I began to understand, too. I felt happier after a bit of digging. Ecstatic when something grew. Worried when it didn’t. I transplanted a whole row of iris bulbs from the overgrown and unseen bed at the side of the house. The next morning, they’d all been dug up. I went online and asked what could have done this. The answer came back: Giant Pandas. I think Mum was closer to the mark when she blamed the squirrels. I planted and hoed, weeded and watered. Despite my better judgment, I started making plans for the following spring. But that September, Mum fell and broke her hip. She could no longer walk, no longer live in her house. We took her to the little enclosed garden in the hospital the day we told her we’d found a good nursing home for her to move into. As I told her about it, she quietly dead-headed the crysanthemums, checked their soil to see if they were getting enough water. She nodded quietly. Her season at home had ended. She would see how she liked her new arrangements. When we sold her house, the new owners came in and dug up the garden we’d worked on the previous summer. Everything came out, including the spirea my father had planted years and years before. “How does it look?” my mother asked when she heard we’d driven past. “You wouldn’t like it,” I told her. They’d aimed for a Zen garden but had peppered it with too many Buddhas and metal butterfly sculptures. “It doesn’t matter,” I insisted. “We knew it wouldn’t last.” And besides. We had our memories. She lived in the nursing home for two years. Every time we visited, we’d take her outside. She’d breathe deep of the the fresh air and check to see how the planter pots were doing. Her friends brought houseplants for her room. She’d fret that she didn’t want to be bothered caring for one more living thing, after all the others. But when I made to take them home, she’d say, no, leave it. And ask me to give it a drink. Her very last project was to plant up a pot of paperwhites. Then the cancer she’d struggled with for over a year made her too weak to get out of bed. Eventually, the family was called and we began our vigil by her side. Before she slipped away into unconsciousness, I showed her the paperwhites, in full bloom, well ahead of schedule. I will never be the gardener my mother was. I still draw my strength from other things. But every fall, I do make plans. And every spring, I dig. Thank you so much for sharing this. It was beautiful. crying…love you and love your mum. I’ll think of your mom whenever I’m in the garden. ….and probably giant pandas too!